GIVE THE GIFT OF WINNING! 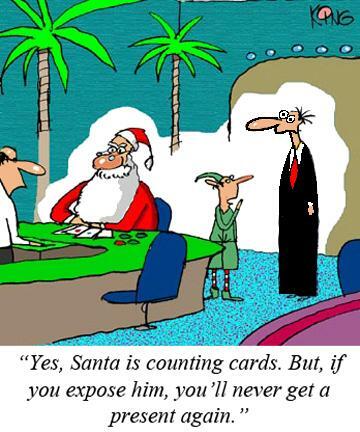 We have books, strategy cards, DVDs, and training software for blackjack, video poker, and craps that make great holiday gifts for family and friends. All products are discounted. There is still time to place your order. Click here to browse our secure online store. This month we have several blackjack reports, covering casinos in north Las Vegas (by KC Brooks), east of the Strip (by Stu D. Hoss), Atlantic City (Frank Scoblete, and Pennsylvania (by Mark Gruetze, who also updates the review of the blackjack rules by the Pennsylvania Gaming Commission). In addition, Ralph Stricker describes a trip his team took to the famed Monte Carlo casino, using concealed blackjack computers. Vinny DeCarlo completes his three part series on player scams, this month focusing on how cheating dice players use hollowed chip stacks to steal chips from casinos (check out the photos). Have you ever wondered about the characters that appear on playing cards (King, Queen, and Jack), specifically, the history behind them and why they were selected to be on the cards? Read Basil Nestor's article for the interesting facts. John Grochowski answers questions from players about renting a blackjack table, strategies for Quick Quad (video poker), and whether it makes a difference if you stop the spinning reels when you play slots (some slots machines have this feature). Frank Kneeland continues his series on the psychology of gambling, and Frank Scoblete describes how Golden Touch dice controller Skinny recently whacked the casinos in Atlantic City at craps with his amazing dice-control skills. Lastly, we have a summary of upcoming major blackjack tournaments around the country, courtesy of www.blackjacktournaments.com. American Casino Guide for 2012 is Here! Here at BJI, we LOVE the American Casino Guide, which has been published for many years now. It is full of amazing casino discount coupons that every player should have! This year, the price is even lower, so there's no excuse to not order a copy! Our price is $11.75, which is over $7 off the retail price. Click here to order a copy for yourself, or as a gift, today. Copyright ©2011, Jerry King, www.jerryking.com. All rights reserved. This month's great "insider" article appeared in issue #30 of the BJI and it includes advice from a Pit Boss on what you should do to maximum your comps when you play blackjack. E-mail subscribers can also read each month's issue online at our web site: BJI Issue #143, December 2011. Are you serious about winning at Blackjack and beating the casino? Then start winning today with Speed Count, the world's easiest, mathematically proven advantage method of play for blackjack in casinos. Developed by DeepNet Technologies, makers of advantage gambling training products for over 10 years, this training software package has everything you need to master the Speed Count card counting method. Only $55... $10 off the normal price for BJI readers! 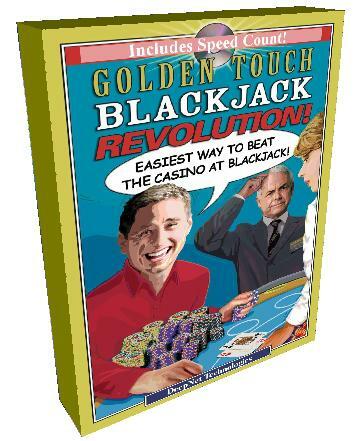 This package includes over 100 pages of 15 pass/fail exercises in our Count Master e-book, and includes the complete Golden Touch Blackjack Revolution! e-book by Frank Scoblete as well, which introduced the world to Speed Count. Available for instant download thatwill have you up and mastering Speed Count in minutes. Also available on CD, mailed to your home. NEW! Available for iPhone in the Apple App Store. and start winning at blackjack! Play Better Blackjack — Learn to Beat the Casinos! "A favorite of card counters for many years!" "The training modes are the best I have seen in blackjack counting apps." Blackjack Mentor is an instructional aide to help you become a better Blackjack player, and master basic strategy. Packed with fun training drills, and 144 built-in tables for different blackjack rules (including surrender and ENHC). "This app is perfect. There's no other app like it."" "If you are serious about improving your blackjack skills, give this app a try." "KC Brooks reports on blackjack playing conditions at three casinos located in the northern part of Las Vegas..."
"Stu D. Hoss reports on the blackjack playing conditions at three casinos located east of the Strip..."
"Presque Isle Casino is small. Even with a nine-table poker room that opened in October, it has just 52 gaming tables, the fewest among Pennsylvania's 10 casinos. It has 2,070 slot machines, fewer than any other in the state except Philadelphia's SugarHouse, which has 1,602. The blackjack games..."
"This a true story about our team trip to the famous Monte Carlo casino using concealed blackjack computers..."
"Read the latest news from Atlantic City, including a summary of playing conditions in each casino, and which casinos have the best blackjack (and craps) games..."
"More secret scams that cost both the casino and unsuspecting player's untold fortunes over the years..."
"You notice their silent stares, especially when the game takes an unexpected turn. Two red queens watch stoically and with a hint of resignation as a low-rent trio of ten, six, and five beats them. The king of spades clutches his sword and seems filled with purpose when he's paired with a red ace; he subsequently obliterates a couple of defenseless red jacks..."
"Grochowski answers reader's questions on renting a blackjack table a strategy for the video poker game known as Quick Quads, and the consequences of stopping the spinning reels yourself on a slot machine..."
"More tips from Frank Kneeland to prevent you from falling into the psychological traps that can cloud your thinking..."
"It is rare that you can flat out say, "So and so destroyed the casinos at craps because of his controlled shooting for the last four days!" However, I am happy to announce that Golden Touch dice control instructor Skinny destroyed Atlantic City on Monday, November 7; Tuesday, November 8; Wednesday, November 9 and Thursday, November 10. Here's how he did it..."
"Check out the schedule of major blackjack tournaments in December and January by region in our Blackjack Tournament Report courtesy of blackjacktournaments.com..."